Hello everyone! Wow, just looking at the date of my last post and I see that I have been letting time fly faster than I thought. Sorry about that. So, what have I been up to… Well, I started a new job (yea!) and made a few new friends (hello to all my new friends at my new job!!) and of course, I have been studying for my exam. (whew!!!) Still cooking but my energy is pretty much spent by around 9 pm. Today, I had a wonderful evening with a my husband and our good friends and I felt good enough to sit and type. 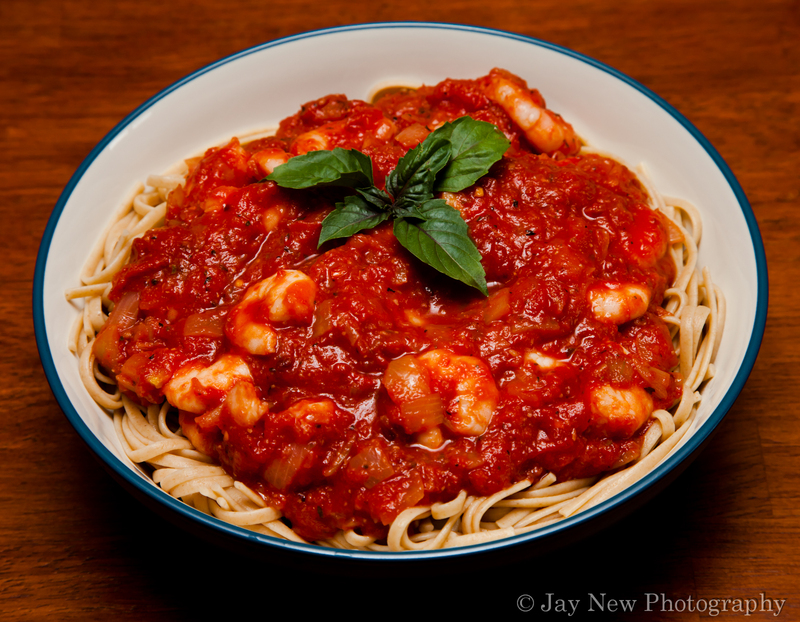 Today, I am sharing a recipe for Shrimp Fra Diavalo. I realized that I don’t have many seafood recipes posted. I absolutely LOVE seafood but until recently, I had not been able to fine a reputable source for my seafood. Fra Diavalo (or Brother Devil in Italian) is a spicy sauce for pasta or seafood (or both!). It is normally tomato based and uses chili peppers for spice. The first time I had ever had Shrimp Fra Diavalo, was when I was on a cruise in Alaska. The cruise had a “tour the kitchen” event in which we could go through the large kitchens of the ship to see how everything is prepared. At the end, they gave a wonderful demonstration on making a Tiramisu and the MaitreD, himself demonstrated Shrimp Fra Diavalo. Naturally, I was intrigued by such a simple yet flavorful recipe. At the end of the event, they were selling books of recipes served on the ship and the head chef and MaitreD were there to sign them. I was already friendly with them and when I got to them, we had a delightful conversation in which I mentioned how much I liked the sound of Shrimp Fra Diavalo. The next day, we continued on our cruise and when it was time for dinner, one of the waiters, upon hearing our name, mentioned that the MaitreD was waiting especially for me. I was surprised. When the MaitreD arrived, he explained that he had waited for my party to arrive because he wanted to personally make for our table (and our table only), Shrimp Fra Diavalo. The waiters quickly put together a tableside stove and with a flourish, he made and served the most delicious meal! It was a memory not soon to be forgotten! What an honor. Ahh memories. Well 🙂 here is a simple version of that wonderful dish. You can always adjust the spice to your taste. Enjoy! Cook pasta, according to the directions on the package. Heat 1 tablespoon of olive oil and saute garlic until it starts to turn slightly brown. Add shrimp and cook until shrimp is cooked. Add remaining olive oil and saute onions until the onions are softened. Add remaining ingredients and cook until mixture has thickened. Add shrimp and mix to combine. Toss in pasta or serve over pasta. This is my type of pasta, shrimps, tomatotes, hot and spicy. This is hard to resist when it is served on our table! Look at you… starting a new job and making new friends :). I knew you would do great because you’re such a wonderful person. And let me just say, this Shrimp Fra Diavalo looks delish! Glad to hear the new job is going well. Wonderful post. I love knowing the meaning of names for dishes. This one looks really good, and it’s one I haven’t tried. Yum! What a great memory! Good luck on your exam and congrats on the new job! I understand how busy you feel, our house is the same way right now! Thank you for the congrats and the good luck *HUGS* I am so happy about your new house! I can’t wait until we finally are able to afford a house. So many new possibilities! I love my current home though, so I am not in too much of a hurry. Good luck with all the packing and arranging!